In 2000, President Clinton designated 53,000 acres of federal land in South Oregon as a national monument due to the high variety of species in a geographically small area. The Cascade Siskiyou National Monument is the first monument in the nation that has been set aside solely for the protection of biodiversity. The monument’s extreme diversity can be partially attributed to its geographic location at the convergence of three distinct ecosystems; the Great Basin, the Cascade Range, and the Siskiyou Mountains. In 2009, President Obama approved an expansion of land protection allowing 23,000 acres of the monument to be designated as the Soda Mountain Wilderness. Federal wilderness protection ensures the highest level of habitat preservation by disallowing motorized activity and asking visitors to abide by the “Leave No Trace” policy. Botanic diversity is high throughout the monument due to the extreme differences in elevation, soil composition and hydrology. Many endemic species can be found in this area where the eastern Oregon desert meets the western Oregon fir forests. One of the unique species present in the monument is Calochortus greenei, a mariposa lily that has been listed as a species of concern in Oregon and California. There has recently been a proposal to change the listing to "threatened" in the state of Oregon. Calochortus greenei (Greene’s mariposa lily) is a member of the lily family that reaches 10-30cm in height and has a large basal leaf that is glaucous (waxy) on both sides. The flowers, which bloom in mid-summer (our monitoring occurs in mid-June, when the plants are still in bud), are pink to purple in color and are extremely hairy on the inner surface. A detailed species description can be found here. Greene’s mariposa lily tends to coexist with a similar species, the Tolmie star-tulip, which flowers slightly earlier in the year. The Institute for Applied Ecology has conducted a 10-year study on the effects of mammal herbivory by constructing permanent large mammal exclosures (targeting the exclusion of deer and elk) paired with uncovered control plots. In addition, “all-mammal” exclosures (targeting the exclusion of rodents) were installed at two of the three study areas. The study areas were originally designed to provide a range in terms of intensity and duration of cattle grazing, but all grazing ceased in 2009. 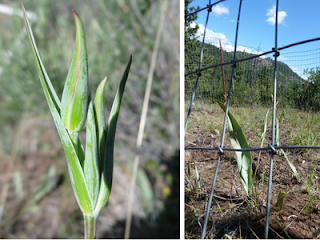 At each site, demography plots were established to track the survival of individual plants. Greene’s mariposa lily is capable of entering a dormancy phase and then reappearing, so monitoring across several years was necessary to accurately describe survival rates. 2012 was the final year of monitoring and all of the data collected will be used to produce a Population Viability Analysis and to make recommendations for future management. Several of the monitoring sites were difficult to reach given the minimal usage of roads throughout wilderness lands. Luckily, we had the help of a BLM botanist who knew the backroads well and was able to winch a fallen tree out of the road so that we could reach one of the monitoring sites. The various study areas ranged in elevation and many provided fantastic views of Mt. Shasta and Mt. Ashland. Wildlife sightings included gopher snakes, several species of raptors, and a bobcat. A variety of plant species were flowering, including harsh Indian paintbrush (Castilleja hispida), blue-eyed grass (Sisyrinchium idahoense), silvery lupine (Lupinus argenteus) and carrot-leaf horkelia (Horkelia daucifolia).